Edward R. "Toad" Schuller, age 91, of Alliance, passed away at 8:30 p.m., Wednesday, June 27, 2018, at Community Care Center of Alliance. He was born, May 19, 1927, in Alliance, Ohio, to John and Anna (Schneider) Schuller. 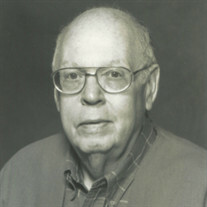 Ed was a graduate of Alliance High School in the class of 1945 and attended Miami University in Oxford, Ohio. He served his country in the United States Air Corp. He was formally employed at Morgan Engineering as an estimator, Grove Refrigeration as a salesman and worked security at Alliance High School where he met many students and teachers who call him "Toad." He really enjoyed his working career. Ed always enjoyed sports and was sports manager in both high school and college. He was a member of St Paul's Lutheran Church and the BPOE Elks No, 467 of Alliance. Ed is survived by his wife, Sally (Turnbull) Schuller, whom he married April 12, 1953; daughter, Diane Schuller of Plano, Texas; son, John (Keri) Schuller of Plano, Texas; and his grandchildren, Ryan (Eliana) Schuller, Kyle (Sarah) Schuller and Laura Schuller. Services will be held at 11 a.m., Monday, July 2, 2018, at Cassaday-Turkle-Christian Funeral Home with The Rev. Timothy Muse officiating. Friends may call from 9 to 11 a.m., prior to the service. Interment will be at Highland Memorial Park. Memorial contributions may be made to the St. Paul's Scholarship Fund P.O. Box 3830 Alliance, OH 44601 or to Alliance Hospice 2461 W. State St. Suite B, Alliance, OH 44601.